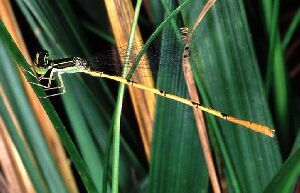 The Citrine Forktail damselfly has rarely been seen in Canada. This species was discovered for the first time at both Ojibway and Point Pelee this year (photo above). Monday, September 25: This is the best time of the year to search for Orange-crowned Warblers. They are typically found with Nashville or Tennessee Warblers in patches of goldenrods or shrubby vegetation. Fred Urie spotted 74 Nashville and 3 Tennessee Warlers at Ojibway Shores and the adjacent cabbage field on September 19. Monday, September 18: A nice kettle of several hundred Broad-winged Hawks flew over the nature centre this morning. Yesterday well over 2000 Broad-wings were seen kettling over south Windsor and the town of LaSalle. These hawks are on their way to their wintering grounds in South America. Fred Urie reported a Clay-colored Sparrow at Malden Park today and another 600 Broad-winged Hawks. Thursday, September 14: Ojibway had a birding trip to Point Pelee yesterday. A cold front brought the first big push of thrushes into the park and warblers were abundant. Notable sightings included 150 Blackpoll Warblers, 80 Magnolia Warblers, Northern Parula and White-eyed Vireo. Birds were not the only migrants observed. A Silver-haired Bat and Red Bat were seen at the tip. Monarchs continue to be present in very low numbers. There were many warblers at Ojibway today including a Golden-winged and Northern Parula behind the nature centre. Other migrants typical for mid September include Ruby-throated Hummingbird, Ruby-crowned Kinglet, Red-breasted Nuthatch and Grey Catbird. Click here for August 2000 sightings.